Pick-Up/Drop-Off of Passengers - The curbside pick-up and drop-off areas in front of both passenger terminals are extremely congested. Therefore, no parking or standing, nor picking up or returning vehicles, are permitted! Complete your pick-up or drop-off as expeditiously as possible! Choice of Car Parks - You can use any of the 24-hour car parks in front of either passenger Terminals 1 or 2. 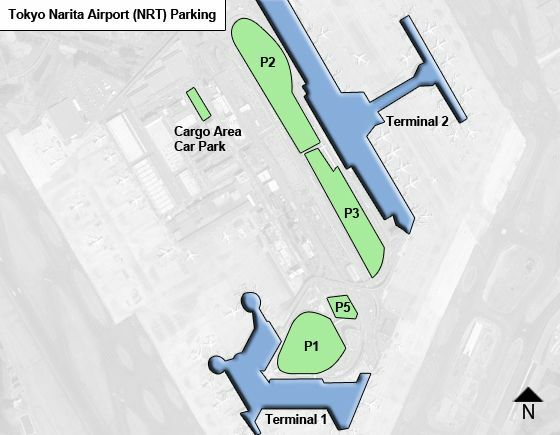 Make sure you know which Terminal you are departing from (depending on the airline you chose) and use the car park designated for this Terminal: Terminal 1 - use car parks P1 or P5 (P5 has discounts for long-term parking); Terminal 2 - use car parks P2 or P3. Car parking can be reserved by contacting GreenPort Agency (a subsidiary of NAA). P1 (for Terminal 1 users) - a 3-level car park with 1,000 spaces. P3 (for Terminal 2 users) - a ground level car park with 120 car spaces. Every 12 hours thereafter �900 or �1,800/day (for both P2 & P3).